Anyone connected to the financial markets industry knows just how difficult it is to accurately predict price changes, duration and the amplitude of trends. Billions of dollars are spent annually on research derived from varying models, economic, fundamental analysis, mathematical algorithms and even artificial intelligence programmes. But is there efficiency? Has market analysis really improved over the last several decades since the computer revolution? It seems that more complex ways are being experimented in order to predict price trends but that hasn’t revolutionised the industry. Most large asset managers employ huge teams to outperform major indices which provide the benchmark for performance. However, most active managers are left either underperforming or are marginally ahead of the game. Consider to add all the twists and turns in a market trend together over a year. This would account to a far greater percentage swing than just a trend that measures its starting point in January and its completion in December. Which means there’s a lot of wastage – inefficiency. Crude Oil or Forecasting Nightmare? So, it was no surprise to read a recent report from CNBC which ran its story around a senior research analyst working for a major Oil brokerage company based in London, U.K. The analyst commented in its latest research note that ‘There are so many uncertainties surrounding the oil market that it makes it virtually impossible to predict developments for the rest of the week let alone for months or a year ahead’. The report went on ‘There are economic and geopolitical developments to deal with and these can change almost on a daily basis’. The analyst described oil market conditions as a ‘forecasting nightmare’. Now I’m the first to be sympathetic. I know just how difficult it can be to predict future price development several months in advance. Many analysts have climbed to fame over one maybe two historic calls. A few names, unmentioned here rose to notoriety during the financial-crisis collapse of 2007-09 but have since faded from view. Yes, because it’s difficult. Most analysts pick their way through short-term calls which are about 3-5% per cent away from current levels, erratic as that performance may be. It’s a bit like two fleas playing ping-pong (table-tennis) on the back of a dog. Yes, they have some idea of the limits of the balls movement. But absolutely no idea about the direction of the dog. But there’s a methodology that moves away from the ‘incrementalist’ idea of ‘linear-thinking’ which is better tuned into the concept that markets are non-linear progressions of action/reaction processes – and that’s the Elliott Wave (EW) methodology. Can Elliott Wave predict Crude Oil? Our specialisation in the EW model has produced some uncanny market calls over the last 25+ years, across all asset classes. Many cannot be scrutinised as random forecasts because of the sheer complexity of pattern, form, price amplitude and duration employed in that analysis. If you’re a mathematician and understand the probability of forecasting such trends, then you’ll know that to predict something so arcuate would be hundreds-of-thousands against – and if repeated, is so mathematically improbable that the only reasoning would be to confirm that there is an underlying law that is being applied in the process. So when it comes to Crude Oil analysis, let’s see whether the Elliott Wave model has merits. The next six charts represent a Track Record of EW price forecasts published in WaveTrack International’s bi-weekly and/or monthly analysis covering the last 3-year period. Crude Oil is engaged in a three price-swing zig zag decline that began from the July ’08 all-time-record high of $147.27, labelled A-B-C. Basis Elliott Wave and Fib-Price-Ratio analysis, wave C downside targets were measured towards $25.60-25.26+/-. The price at the time of this analysis was at 33.16 which means it was forecasting a decline of approx. $7.50 dollars but then ending the entire zig zag pattern/decline from $147.27, then staging a reversal to begin a new uptrend. Crude Oil ended the three price-swing zig zag decline at 26.05, just $0.45 cents from the projected low. Coincidence? Hardly! The price responded not by any fundamental news at the time – sentiment was very bearish then – but it instead responded to the Laws that define price development as seen through the Elliott Wave Principle. Crude Oil was already trading up to $43.47, a recovery of +66% per cent. And not only that, the updated analysis then projected prices unfolding higher but within specific parameters, or conditions – the advance must unfold higher into a three price-swing formation, labelled A-B-C, and amplitude analysis using Fib-Price-Ratios predicted the advance would end towards $75.09+/-, then turn down dramatically afterwards. It’s taken over 2½ years for the A-B-C zig zag upswing to develop and only in Aug.’18 is it approaching original upside targets of $75.09+/-, now revised to $78.90+/-. But the pattern isn’t quite finished – a little more upside was forecast from current levels of $68.72 to $78.90+/-. Afterwards, a big downswing would begin with initial targets towards 55.70+/-. Crude Oil traded up to $76.90 in late-October, ending the A-B-C zig zag pattern that was forecast almost 3-years earlier to $75.09-78.90+/-! The next forecast predicted a decline towards min. $55.70+/-, revised here towards $44.75+/-. Price declines continued down to a final low at $42.36, a massive drop of $34.54 dollars or a -44.9% per cent decline. Elliott Wave analysis then forecast a three price-swing zig zag pattern developing to the upside over several months, labelled (A)-(B)-(C) – upside projections were to min. $61.70+/-, max. $66.80+/-. Crude Oil ran higher, exactly as predicted, unfolding into a three price-swing zig zag pattern, (A)-(B)-(C) with price targets being reached at 64.79 (April 8th). Analysis now predicts a sharp downswing over the next several months, towards $33.70+/-. NYSE Composite Index + Wilshire 5000 – December’s Five Wave Uptrend Tests Upside Targets – Preparing for Counter-Trend Downswing!! We’re pleased to announce the publication of WaveTrack’s CURRENCIES & INTEREST RATES 2019 video updating medium-term ELLIOTT WAVE price-forecasts. 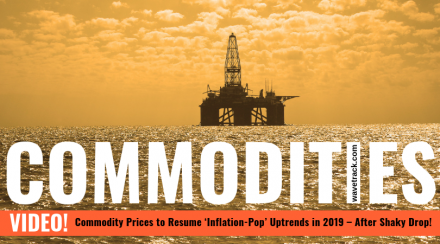 Commodities Prices to Resume ‘Inflation-Pop’ Uptrends in 2019 – After Shaky Drop! We’re pleased to announce the publication of WaveTrack’s annual Commodities 2019 video Outlook of medium-term ELLIOTT WAVE price-forecasts. Today’s release is PART II, COMMODITIES. Part I was released last month and Part III will be published in February. •	PART III – CURRENCIES & INTEREST RATES – coming soon! Crude oil cycles were still moving higher last January but they were next due to form a peak in August ’18. Meanwhile, crude oil was trading at 60.39 but was forecast up to 78.90+/-. Also Brent oil was trading at 66.92 with upside forecasts to 77.22+/-, max. 93.80+/- (averaging 85.50+/-). 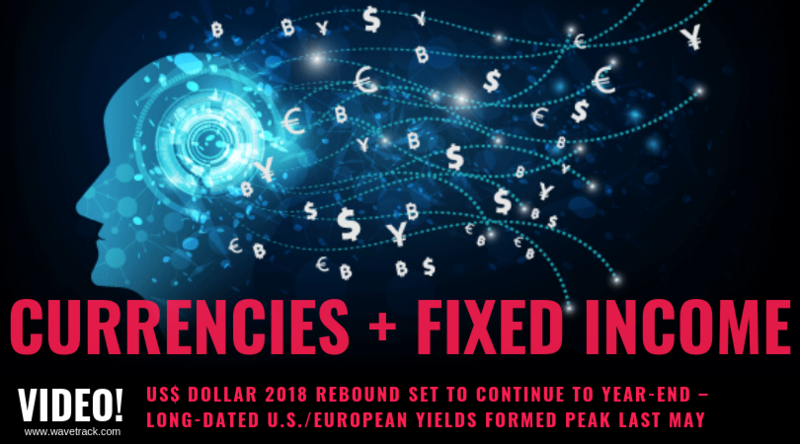 The main drivers that permeated most asset classes in 2018 also affected commodity prices too – to begin with, the US$ dollar staged a successful turn-around last February, heading higher to begin a counter-trend correction following a -15% per cent drop in 2017. That pulled Base and Precious Metals lower in-line with forecasts. Copper was late in beginning its counter-trend decline, although others in the group, Lead and Zinc topped-out right on cue. Copper has since declined by -22% per cent! The Base/Precious metal miners began to fall rapidly as the U.S. stock markets staged a strong decline late-January/early-February, triggered by the emergence of a tariff trade war between the U.S. and its global trading partners. Despite a recovery from April through to late-September, the overall sell-off resumed in October, pulling the miners even lower although Gold and Silver have since formed important lows in August/November. Gold was forecast down to interim targets of 1157.65+/- from 1303.00 and ultimately towards 1123.00+/-. The August low was 1160.24. Silver was trading at 16.96 in January ’18 with downside targets to complete a 2½ year correction towards 14.04+/-. The November ’18 low was 13.89. Palladium was singled-out in last year’s forecasts as maintaining its uptrend – it went on to gain +20% per cent into December’s high. The Energy markets were in a slightly different timing-rhythm to other commodities although upside targets for Crude Oil towards 78.90+/- ran slightly shy to end a 2½ year zig zag upswing at 76.90. But the Elliott Wave zig zag was perfectly formed into the early-October high – it has since declined by -44% per cent! When stock markets declined in early-2018, many large investment houses were caught out. Mainly because analyst’s economic outlooks remained on a growth path without any interruptions – a big linearly-extrapolated mistake. The next peak in late-September was more ‘telegraphed’ but still, asset managers were overly committed in their long portfolio positioning. It makes you wonder what has to happen before liquidation occurs? – the answer – a severe sell-off! That doesn’t sound logical if the idea is to buy low and sell high as the maxim goes. But it’s tough to change human habits unless you’re trained to look at things differently, as many do who practice the Elliott Wave Principle over many years. But even those that do can often fall into the traps. Mainstream EW practitioners are labelling the U.S. stock market’s uptrend from the financial-crisis lows of 2009 as ending a five wave impulse pattern into the 2018 highs. Even though we sympathise, this doesn’t make sense when taking a macro-view alongside so many other global indices, those traded in Europe, Asia and many Emerging Markets. It neither fits together with other asset classes like COMMODITIES. Since early-2010, following several months of stock and commodity market gains, we’ve identified an upcoming ‘INFLATION-POP’ within the multi-decennial deflationary cycle. That would ultimately see many U.S. and global stock markets make new record highs into the next decade along with commodity markets. Well, that process hasn’t finished yet! 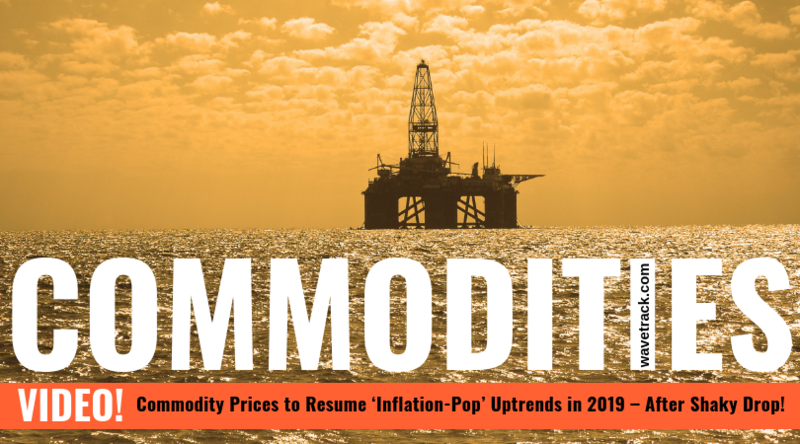 Commodities markets are forecast significantly higher in 2019 into the next few years, extending the next phase of the ‘INFLATION-POP’. For this reason this next phase is going to be HUGE because it’s the final sequence of the cycle. Consequently it’s going to be important to sift through the different commodities and their equities to see which maintain outperformance and those which will simply limp higher. But rest assured, this next huge advance is coming! We’ve amassed over 75 commodity charts from our EW-Forecast database in this year’s Commodities 2019 video. As a result each one provides a telling story into the way Elliott Wave price trends are developing in this next INFLATION-POP’ phase of cycle development. Also we’re taking a look at some very specific patterns that span the entire SUPER-CYCLE. Explaining why the super-cycle began from the GREAT DEPRESSION lows of 1932 and not from the lows of 1999 and how this ended in 2006-2008. And why the multi-decennial corrective downswing that began soon afterwards is taking the Elliott Wave pattern form that it is. Furthermore, we’re updating some amazing cycles in the US$ dollar that you’ve simply got to see. Plus others for the CRB-Cash index which begins from the year-1760 (yes, 259 years ago! ), Copper, Zinc, Gold, Silver and Crude Oil. Now that’s an amazing outlook. Last year’s forecasts were so accurate, it’s like having your very own crystal ball! And there are huge implications for the price development of Energy prices in 2019. Above all the real give-away that corroborates our theme is revealed in the Elliott Wave pattern development of the XLE Energy index – it’s a must-see! We invite you to take this next step in our financial journey with us. Video subscription details are below. Just follow the links and we’ll see you soon! Each video runs for at least 1 hour 20 minutes and it’s packed with SPECIFIC Elliott Wave price-forecasts (the Commodities Video is already 1 hour 58 mins. long!). BONUS! Each of the 38+ charts. The Commodities Video Outlook 2019 contains 70 charts already. illustrated in the VIDEOS will be created into a .pdf document/report and sent to you so that you can always keep these to refer to! PART III will be available in a few weeks’ time (February/March 2019!) – we’re working on it! – Please state if you wish to purchase the SINGLE VIDEO – Commodities Video 2019 for USD *48.00? – Alternatively, we can process credit card payments for you as well – please contact us. Thank you. 2018’s 4th WAVE CORRECTION APPROACHING A TERMINAL LOW IN Q1 2019! We’re pleased to announce the publication of WaveTrack’s Annual 2019 video updates of medium-term ELLIOTT WAVE price-forecasts. Today’s release is PART I, Stock Index Video – Parts II & III will be published during January/February. 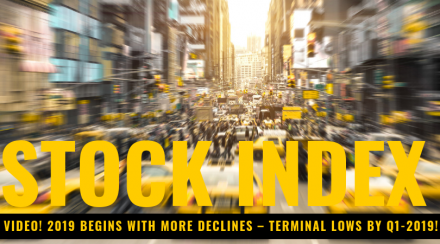 2019 Begins With More Declines – Terminal Lows by Q1-2019! It looks like 2018 set quite a few records! The exponential advance that carried over from December 2017 into January ’18 finally reached a terminal peak on January 31st at 26616.70, Dow Jones (DJIA) and 2872.87, the S&P 500 – both then staged an inverted ‘V’-shaped reversal decline that initially shaved -4.6% off values. CNN reported it was the ‘scariest day on Wall Street in years…the biggest decline since August ’11…the Dow plunged almost 1,600 points – easily the biggest point decline in history during a trading day’. That was only the beginning though! – declines continued through February until it formed a low 2-weeks later but by that time, indices were down by -11.8% per cent. Volatility continued afterwards – it only took another 2-weeks for the S&P 500 to trade up by +10% per cent – which was just prior to a downswing into the early-April lows, a decline of -8.8% per cent! By that time, sentiment turned really bearish – Investors Intelligence reported that ‘Bulls’ declined from 47.6 to 42.2 which was the lowest bullish reading since right before the US presidential election of November 2016. The number of ‘Bears’ rose marginally but remained at a low historical figure of 18.6. What did the markets do next? They ran higher albeit at a more modest pace but advancing by +15.0% per cent until it reached the late-September/early-October highs – then bam! The Dow and S&P collapsed lower. USA Today reported ‘the U.S. stock market suffered its biggest October decline since the 2008 financial crisis, prompting shaken investors to reassess the staying power of a bull run that began more than nine years ago’. Following rallies into November, markets declined again in early-December. London’s Financial Times reported ‘Volatility leaves Wall Street set for worst December since Great Depression’. Christmas Eve’s (December 24th’s) decline was particularly severe as the Dow (DJIA) gapped lower by 667 points delivering a -19.8% per cent psychological punch from October’s high. The S&P 500 registered a decline of -20.2% per cent, the threshold that many economists define as a ‘bear market downtrend’. Since those lows, the major indices have recovered by +7.5% per cent. The volatile price-swings of 2018 and the net declines from January’s peak are blamed on the Federal Reserve’s continued monetary tightening and interest rate hiking programme, U.S. President Trump’s trade war with China and its allies and concerns of a global economic recession forewarned by the severe flattening of the U.S. yield curve. We know just how scared the markets are right now through various sentiment readings. The latest data from AAII showed bulls collapsing 17pts to only 20.9 from the previous week’s level of 37.9. That was the lowest figure since May ’16 – wow! Then on Dec. 19th, Investors Intelligence reported Bulls declined from 46.7 to only 38.3 although most of this downsizing went to the middle-voting with Bears rising 1pt to 21.4. Snippets of Bank of America/Merrill-Lynch’s fund manager survey for December have appeared on the internet. Highlights include a reading of ‘extreme bearishness’ in equities, a huge jump from long-equities which is now negative -15ppt to long bonds at +23ppt and defensive trades in Consumer Staples at +13ppt (approx.). What does this tell us? – it suggests the equity/stock market is priming itself for a major low although the report itself says that it does not consider its readings as bearish enough to trigger a buy signal! With such volatile price-swings over the last year, you might think they’re impossible to predict, but in actual fact, the opposite is true! – THEY ARE PREDICTABLE! Ray Dalio, the American billionaire and hedge fund manager of Bridgewater Associates sent out an e-mail to clients in December. It had this to say: ‘As you probably know by now, I believe that everything (i.e., all reality) works like a machine with cause-effect relationships that drive what happens, and that to be effective it’s essential to have a good mental model of how those machines/realities work and to have good principles for dealing with them well’. Sounds like an Elliott Waver to me! – ha! But in reality, Ray Dalio looks through the economic lens model – productivity growth, the short-term/long-term debt cycles in coming up with his concept of how the future looks. There’s a lot of competing aspects to consider this year and to gain a realistic glimpse of what’s to come, we’re going to have to separate the proverbial wheat from the chaff. That means being unbiased and relying on the facts. The dominant Elliott Wave theme is that September/October’s highs ended a five wave impulse uptrend that began from the financial-crisis lows of Oct.’08/March ’09 – but is this correct? If the S&P 500 and Dow Jones indices are analysed in isolation, then there is a reasonable chance this ended a five wave ‘structure’. But when examining the same pattern in log-scale and overlaying Fibonacci-Price-Ratio analysis to verify, the pattern begins to degrade – no confirmation is forthcoming. Back in year-2000 at the height of the dot.com boom and several years later at the highs of October 2007, developed market indices formed corresponding terminal highs with Emerging Markets and Commodities – positive corrections combined with terminal Elliott Wave uptrends formed at the same time. They declined together in corrective synchronisation in the sell-offs that followed. But synchronised EW-pattern highs never happened in 2018. In fact, Emerging Markets and Commodities are still engaged in five wave uptrends that resumed in early 2016 and are far from complete. Yes, they began corrective downswings in 2018 but that’s all. But that means the secular-bull uptrend for U.S. and other global indices is still in upside progress! This year’s 2019 Elliott Wave forecasts takes an updated look at these disparities but aligning them into a synchronised process over the next two-year period. Over 60 charts illustrate the intricate relationships between the U.S., European and Asian/Emerging markets. They combine to tell the same story – we’ve haven’t seen a major peak in the secular uptrend just yet! And even if you have doubts, take a look at some of the sentiment and economic indicators that form part of the holistic viewpoint – the Elliott Wave overlay is pretty convincing! The Stock Index Video 2019 wouldn’t be balanced without a look at the more obvious Secular-Bear scenario. As a result, we’ve added some important slides into the mix. What this does is focus the negation levels at which point a nemesis decline is confirmed. For U.S. indices, price levels would need to break below the Feb.’16 lows whilst unfolding into a five wave impulse pattern to confirm the secular-bear scenario. So let’s see! One of the key aspects to the continued secular-bull uptrend is realised from examining the benchmark Eurostoxx 50 index. Its 2015-16 decline unfolded into a typical THREE WAVE CORRECTIVE PATTERN, i.e. a zig zag. Hence, the following advance into the Nov.’17 high didn’t break above the 2015 high. 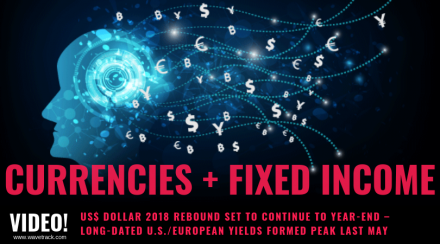 Consequently, this means there’s still a lot of upside potential to come over the next 18-24 month period, albeit European indices underperforming in 2018. Emerging Markets along with many benchmark commodity markets are unfolding into the ‘INFLATION-POP’ schematic first postulated in these reports back in year-2010. Some indices haven’t broken above the old 2010-11 highs yet. However, this is again another strong indicator that secular-bull uptrends remain engaged to the upside. 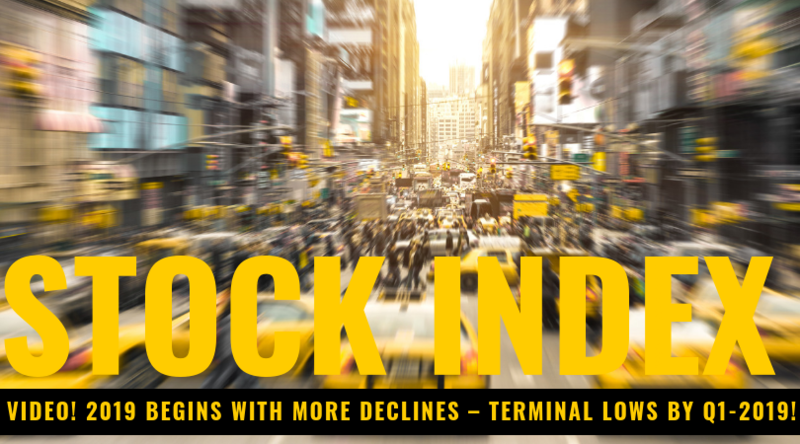 This ANNUAL 2019 VIDEO UPDATE for STOCK INDICES is like nothing you’ve seen anywhere else in the world. It’s unique to WaveTrack International, how we foresee trends developing through the lens of Elliott Wave Principle (EWP) and how its forecasts correlate with Cycles, Sentiment extremes and Economic data trends. We invite you to take this next step of our financial journey with us – video subscription details are below. Just follow the links and we’ll see you soon! Merry Christmas and Happy New Year 2019 to all of you! Merry Christmas & a Joyous New Year 2019! So we hope that wherever you are and whatever your faith, that your Festivities and New Year will reveal the many treasures of Peace, Love and Abundance. This week’s Elliott Wave Compass Reports will be the last reports published for 2018!That’s Wednesday/Friday’s reports, Dec. 19th/21st ahead of the Christmas Festivities. The next EW-Compass will be published on Wednesday 2nd January 2019. If you have any questions next week, please send them in. We’re still here but working to meet deadlines for the publication of our annual 2019 Elliott Wave forecasts. The extent of tracking all four asset classes, so many contracts has expanded exponentially over the last few years. Mainly, driven by the demand from you, our customers! This has necessitated creating all the Elliott Wave charts into a THREE PART VIDEO SERIES. As a result Part I will focus on Stock Indices, Part II Commodities & PART III Currencies & Interest Rates. Seems like Part I might even be ready before year-end. Therefore, watch out for another e-mail message from us soon! Parts II & III will be published in January/February!